^ "Public Broadcasting Act of 1967". 2015-01-14. 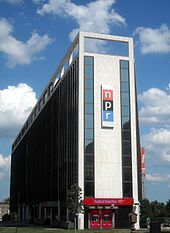 ^ "NPR Maintains Highest Ratings Ever". NPR.org. 28 March 2018. Retrieved 10 May 2018. ^ Chiu, Lisa (March 17, 2011). "Secret Recording Explores Relationship Between Billionaire Soros and NPR". philanthropy.com. The Chronicle of Philanthropy. Retrieved 13 May 2015. ^ Simon, Scott (6 April 2013). "Saying Goodbye To The Old NPR Headquarters". Weekend Edition. NPR. Retrieved 13 May 2015. ^ Farhi, Paul (2018-12-09). "At NPR, an army of temps faces a workplace of anxiety and insecurity". The Washington Post. Retrieved 2018-12-11. ^ "Remote Audio Data Is Here". NPR.org. Retrieved 2019-01-17. ^ "NPR Board of Directors". NPR. Retrieved 2015-03-06. ^ Taintor, David (16 August 2013). "NPR's New Ad Unit Falls Somewhere Between Banners and Native". Adweek. ^ Hart, Peter (8 September 2014). "New NPR Boss: 'We're Going to Be Talking About Brands That Matter a Little Bit More'". fair.org. FAIR. ^ O'Dell, Jodie (30 September 2010). "How NPR Is Leveraging the Twitter Generation". Mashable. Retrieved 22 January 2017. ^ a b Carvin, Andy; Heard, Meredith (30 September 2010). "Results Of The NPR Twitter User Survey". NPR. Retrieved 22 January 2017. ^ "Pocket Casts acquired by NPR, other public radio stations, and This American Life". The Verge. Retrieved 2018-05-03. ^ Farhi, Paul (October 31, 2017). "NPR's top editor placed on leave after accusations of sexual harassment". The Washington Post. Retrieved 2017-11-01. ^ Folkenflik, David (October 31, 2017). "NPR's Head Of News Placed On Leave After Past Harassment Allegations Surface". NPR. Retrieved 1 November 2017. ^ Farhi, Paul. "Michael Oreskes, top NPR newsroom official, resigns amid harassment allegations". The Washington Post. Retrieved 2017-11-01. ^ Stelter, Brian. "At NPR, Oreskes harassment scandal leaves deep wounds". CNNMoney. Retrieved 2017-11-02. ^ "The Declaration Of Independence, 240 Years Later". NPR.org. Retrieved 2017-07-05. ^ a b "NPR tweets the Declaration of Independence, and people freak out about a 'revolution'". kansascity. Retrieved 2017-07-05. ^ "Some Trump supporters thought NPR tweeted 'propaganda.' It was the Declaration of Independence". Washington Post. Retrieved 2017-07-05. ^ "NPR Tweets Declaration Of Independence, Triggers Outrage". Talking Points Memo. Retrieved 2017-07-05. ^ CNN, Nancy Coleman. "No, NPR was not trying to start a revolution". CNN. Retrieved 2017-07-05. ^ "FolkLib Index -Music Reference Books by National Public Radio (NPR)". www.folklib.net. Retrieved 11 May 2017. This page is based on the Wikipedia article NPR; it is used under the Creative Commons Attribution-ShareAlike 3.0 Unported License (CC-BY-SA). You may redistribute it, verbatim or modified, providing that you comply with the terms of the CC-BY-SA.